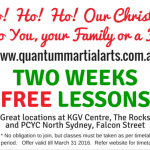 We are running a Christmas Campaign for new starters to trial Quantum Martial Arts in the New Year. 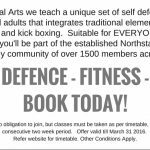 The Flyers for the Offer are attached below, please print and give to friends and family who would benefit from getting fit, disciplined and able to defend themselves. We are also running a Bootcamp Special led by Daz for Monday 11/1 through to Friday 15/1 at North Sydney PCYC from 7-8AM. Bring your commando attitude…you will need it!. Please confirm your interest via info@quantummartialarts.com.au. Places are limited to the first 40 entrants (definitely no more after that), so do not wait. Have a great Christmas and holiday safely and we shall see you on the mats in 2016!